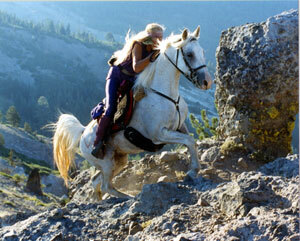 Tulip, owned by Les Carr, is about to break the AERC record for highest mileage horse, ever. Last week at the Grand Canyon XP Tulip reached 18,065 miles! 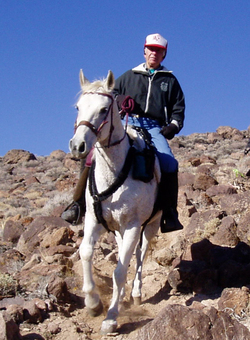 Trilby Peterson's horse Lad currently holds the AERC mileage record at 18,215 recorded miles. Both Lad and Trilby have been inducted into AERC's Hall of Fame. Tucson, AZ, October 26, 2006 --(PR.COM)-- An Easyboot Grip that is! EasyCare recently held a contest to come up with a name for their new hoof boot design. More than 900 name suggestions were submitted. The winner of the Name the Boot Contest is Helen Elsner who will receive a $100 gift certificate from EasyCare and a set of four Easyboot Grip boots. The new Easyboot Grip hoof boot will have a more aggressive tread and is suited for use in wet conditions where a more aggressive tread pattern may be warranted including rain, mud, snow and wet grass. The boot received a thorough test recently at the Grand Canyon XP ride where the footing became slick and unpredictable very quickly. On the first day of this five day multi-day ride it poured rain so hard that horses, riders, and the ground beneath them became completely saturated. Extreme conditions continued when later in the week it began to snow and temperatures dropped well below freezing. Endurance riders using the boots reported a solid ride and said their horses strode out confidently with the Easyboot Grips in the mud, snow, puddles, and wet grass. The new boot is expected to be available at the beginning of 2007. EasyCare cautions that the Easyboot Grip was designed for use in wet conditions and is more likely to wear faster if used in dry or hard surface conditions. While this boot will provide better traction in wet conditions than some other types of hoof protection, it will not keep horses from slipping in some situations and riders should use extreme caution when riding on those kinds of surfaces. EasyCare, Inc. has been a leader in the hoof boot industry for years, beginning with the invention of the Easyboot back in the early 70?s. Since then, the need for boots has grown tremendously as more and more horse owners see the healthy advantages of pulling shoes and switching to natural hoof care. EasyCare is excited about being part of this growing trend. For more information about hoof boots or natural hoof care please call EasyCare, Inc. at 1-800-447-8836, e-mail: admin@easycareinc.com or visit our website at www.easycareinc.com. The American Quarter Horse Association Ride program has reached a new milestone by hosting 100 Rides around the world in 2006. The 100th Ride will take place near AQHA headquarters in Amarillo, Texas, Dec. 2 at Cal Farley's Boys Ranch. This is the first time AQHA has hosted 100 Rides in one year, and this goal will be accomplished during the AQHA Ride program's 10th anniversary. Since 1997, more than 46,000 riders have participated in the program, with the number of rides growing each year. "This is a great accomplishment to reach 100 rides in 2006," said AQHA Executive Vice President Bill Brewer. "The AQHA Ride program has been a tremendous success and a great opportunity for recreational riders." Presented by Sooner and Exiss Trailers, AQHA Rides are open to all breeds and disciplines of riding. The Ride Program provides a great opportunity to have fun on horseback, while enjoying breathtaking scenery and making new friends. Sooner and Exiss Trailers have contributed to making the program bigger and better every year. In celebration of the 10th year anniversary, Ride participants can win great prizes. At the end of the year, an Exiss trailer and a trip for two to a 2007 Ride will be given away. Participants can register at any AQHA Ride event for their chance to win. Each AQHA Ride benefits local and national charities, and provides funding for equine research through the American Quarter Horse Foundation. Join AQHA for the 100th Ride at Cal Farley's Boys Ranch near Amarillo, Texas, on Dec. 2. It will be an event to remember. For more information on the AQHA Ride program or to find a ride near you, visit www.aqha.com or call the Universal Trailer Ride hotline at 888/414-RIDE. Pony (horse) passes 10,000 mile mark!